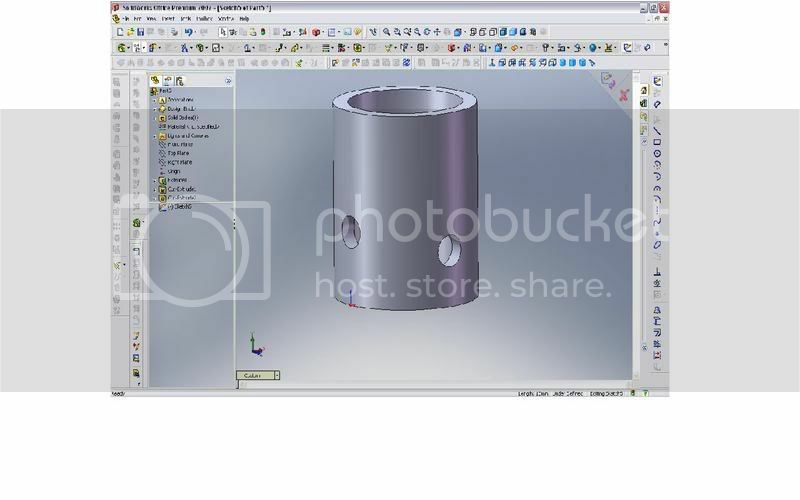 SolidWorks Tip: Normal to Cylinder? Here is a little gem of a tip that I just discovered. (Even after 10 years use I still find little things like this from time to time.) Select a cylindrical surface in a model. Invoke the “Normal to” command and the view will instantly be normal to the axis of that cylinder! This can be useful for models that have holes placed on complex faces or faces that aren’t perpendicular to the axis of the hole. Maybe I’m one of the last to discover this, but I thought it was pretty handy! Things have been CRAZY busy lately (yes…that is a GOOD thing). I’m looking forward to getting some time to post more cool stuff to the Blog in the coming days! Sorry, I didn't get it! I RMB a cylindrical face but couldn't find any Normal to option. Probably a poor choice of words on my part. Select a cylindrical face then invoke the “Normal To” command via the file menu, toolbar or keyboard shortcut and you will see the behavior I described. I originally used the word “select” twice which could be confusing. I have since corrected the description to be more clear. You don't use RMB for this tip at all. I RMB a cylindrical face but couldn’t find any Normal to option. I originally used the word “select” twice which could be confusing. I have since corrected the description to be more clear. You don’t use RMB for this tip at all. What I just noticed in SW2008 – if you select the cylindrical face first, this trick doesn't work….the “Normal To” button is grayed out. You have to hit the button, then select the face. In SW2007, it works either way…. What I just noticed in SW2008 – if you select the cylindrical face first, this trick doesn’t work….the “Normal To” button is grayed out. You have to hit the button, then select the face. In SW2007, it works either way…. This also works with cones (at least in 2007). our corporate Solidworks sub-forum. It may be used by me one day. Steve R. – Great Catch! I haven't switched over to 2008 yet so I missed that one. I will be submitting this behavior as a bug to my VAR next week. Thanks for posting this! I'm glad you like it! Stay tuned for more good stuff coming soon! Steve R. – Great Catch! I haven’t switched over to 2008 yet so I missed that one. I will be submitting this behavior as a bug to my VAR next week. Thanks for posting this! I’m glad you like it! Stay tuned for more good stuff coming soon! I couldn't get it to work doing what I am doing. I have a cylinder that is hollow and I am trying to create a slot between two holes on different planes. Any suggestions? I couldn’t get it to work doing what I am doing. I have a cylinder that is hollow and I am trying to create a slot between two holes on different planes. Any suggestions? I am trying to create a slot between these two holes in this cylinder, on different planes, and a different height vertically. The slot can be the same diameter as the holes or slightly smaller so there is a notch at each end. How would I cut it? Any suggestions? For some reason the screen shot didn't post with your comment. E-mail a link of the screen shot to me using the “E-mail Me” link in the top left corner of my page and I'll have a look at it. For some reason the screen shot didn’t post with your comment. E-mail a link of the screen shot to me using the “E-mail Me” link in the top left corner of my page and I’ll have a look at it.